Archie Johnson — known better as AJ — is a humble man. He is so modest that he didn’t tell many of his coworkers at TAC-The Abilities Connection that he was going to play softball in the Special Olympics USA Games in Seattle, Washington in early July. He didn’t say much when he returned with a gold medal either. TAC CEO Mary Brandstetter discovered Johnson’s participation by perusing the Special Olympics Facebook page. It’s a big deal. A very big deal. Johnson was selected to play outfield for the Ohio softball team for the Special Olympics USA Games earlier this year. He joined more than 4,000 athletes with intellectual disabilities and their coaches who participated in 14 sports. Over 70,000 spectators were expected to attend the event in early July. The purpose of the Special Olympics USA games is to encourage athletes with disabilities to demonstrate inclusion through the power of sports. ESPN covered the opening ceremonies for the games; several celebrities lent their support to the event, and the athletes showed the world what it looks like to lead from the heart. 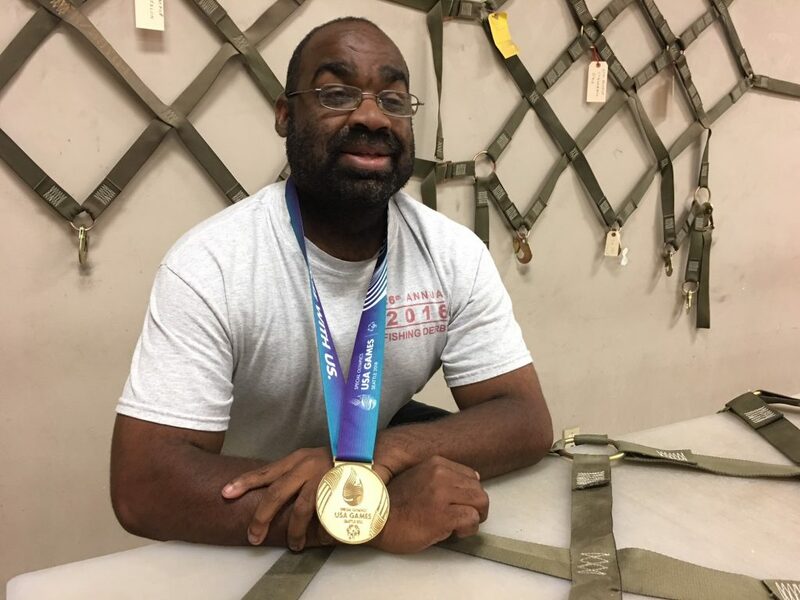 The selection of Johnson to the Special Olympics softball team meant travel, his first trip flying (“It was just fine,” he said), and the honor of participating in Special Olympics on the national level. As an outfielder on the Ohio traditional team, Johnson played well enough with his 16 teammates to beat out teams from Southern California, New Jersey and Florida. His player profile describes Johnson as an all-around excellent athlete, one who enjoys softballs, basketball, volleyball and bowling. His athletic skills are apparent in his approach to his work at TAC said Production Supervisor Jeremy Weaver. “AJ is one of the most dedicated and reliable people I’ve ever had the pleasure of working with,” he said. He is friendly to everyone he meets and respected among his coworkers, Weaver added. Johnson has worked at TAC-The Abilities Connection for nearly 12 years. His job is at the critical tail-end of the cargo net repair business. He inspects, seals the cut ends, rolls, wraps, and bags repaired cargo nets that go back into service. The repaired nets secure loads of military cargo and humanitarian aid to locations all over the world. When asked, and with a small amount of shy pride, Johnson will take his gold medal out of his backpack to show you. He will even wear it around his neck for a moment while you shoot a picture. Then back into the backpack it goes, as Johnson gets back to the business doing his job at TAC.